Kanapir, the place of Tjumpo Tjapanangka's birth, lies between the communities of Wirrimanu (Balgo) and Kiwirrkura in remote Western Australia. Tjapanangka's acrylic paintings, screenprints and occasional glass works reflect this geographic and artistic intersection. While his painting style is true to the Wirrimanu aesthetic, his work also signals the influence of the westernmost reach of the Papunya Tula Artists cooperative. News of the genesis of Papunya Tula Artists – the art movement that formed when senior men began painting symbols of their cultural authority and knowledge onto found materials – reached Wirrimanu in 1971, via Pintupi community networks. However, reservations about the appropriateness of translating sacred information onto paintings for an outside audience initially held back the full-scale emergence of the Wirrimanu school. Following the exhibition, 'Aboriginal Art from the Great Sandy Desert', at the Art Gallery of Western Australia, Perth, in 1986-87, the Warlayirti art centre was established, and soon the explosive vigour and colour of Wirrimanu painting was capturing national attention. Tjapanangka began painting in 1986. His early works adhered to the classic style of depicting the travels of the Tingari ancestors by painting interconnected circles, although with a Wirrimanu twist. He went on to develop a structure in his paintings that focuses on the spare arrangement of symbolic elements surrounded by a charged energy field of pulsating lines. His conservative use of colour highlights the key motifs and draws the eye through the composition in the manner of an animated narrative. 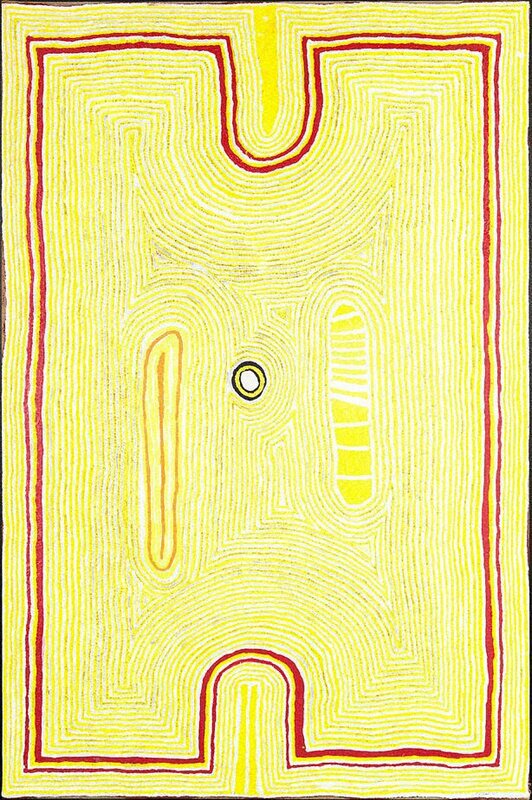 Wati Kutjarra, 2002, relates the story of two ancestral brothers who travelled throughout the Western Desert teaching about the practical aspects of desert life: food gathering, hunting and fire management. The central roundel in the work represents the fire lit by the brothers where they lay down to rest. On either side of the ancestral camp fire – or rockhole, as it is known today – are the impressions left in the ground by the brothers, which remain as features of the landscape. Tjapanangka is a formidable Western Desert personality whose charisma and maverick style are borne out in his paintings. An inveterate traveller, crisscrossing between the camps and outstations scattered throughout the deserts of Central Australia, he is immediately recognisable by his trademark wraparound sunglasses. Well-represented in the Warlayirti Artists gallery and the newly built cultural centre next door, Tjapanangka's art is an exemplar of the cultural verve and pride that wells from the heart of the Tanami and Great Sandy Deserts.